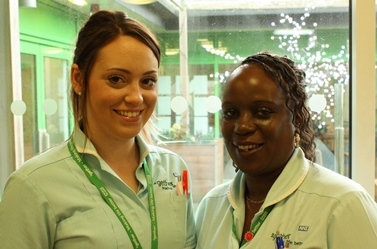 Marva Mcintosh-Rose and Molly Tomkins are Healthcare Assistants at Charlton Lane Hospital in Cheltenham. Charlton Lane provides specialist assessment, treatment and care for older people with functional mental health problems and people with dementia. “We work different shifts, but a typical day shift would begin with us getting patients up, giving them their medication and breakfast. We also carry out observations, as well as weekly weigh-ins. “We spend time with the patients, talking to them, taking them to hospital appointments and helping then with phone calls. We also take them on days out, to places like the garden centre, and mark events, such as Chinese New Year. “The ward is for functional patients; they should be able to help themselves with tasks, such as getting dressed. “It’s a challenging and interesting job; no two days are ever the same. “Patients can be here for the long-term or just for a few months. We get to know them really well and can tell by sight when something isn’t right with them. Find out more about becoming a Healthcare Assistant on www.healthcareers.nhs.uk.